The Davidson Brothers release their latest album Wanderlust on Friday 20 June and have announced a special launch show at Melbourne’s Corner Hotel on Thursday 19 June. The Davidson Brothers have been performing together for over 20 years. They are regulars at many major festivals programs and tour Australia extensively. They have also played multiple times in Europe and the USA. To coincide with the album launch announcement, TheMusic.com.au have exclusively shared a short film on the making of Wanderlust. Known for their high-powered acoustic performances and extraordinary musicianship, the brothers release their seventh studio album Wanderlust in June 2014. Recorded at Sing Sing South Studios in Melbourne by engineer Adam Rhodes (Paul Kelly, Angus & Julia Stone, The Waifs) the new album features all new original material and is an outstanding insight into the Davidson Brothers exploring new areas. Featured on the eleven track album are Jacob McGuffie on acoustic guitar and Louis Gill on upright bass. 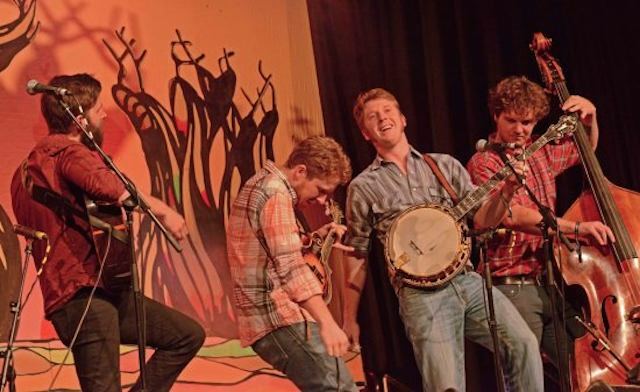 These exceptional seasoned young musicians joined the Davidson Brothers’ live band in 2012 and are both graduates of the Victorian College of the Arts. Hamish and Lachlan show how they can nail the contemporary bluegrass sound with Everytime I Leave and Take Me to the Mountains. The album follows a theme of the desire to travel and draws on new sounds with the roots influenced track It’s Time To Go. Travelling Bluebird was inspired by attending festivals across the country in the family wagon, whereas Lost in Amsterdam was written about the recent experience of touring Europe. Always demanding attention for their instrumental ability, the Davidson Brothers show why they’ve taken out so many prizes including three Golden Guitar awards, with tracks like Grass Hound and Bottle Cappin’ Back Crackin’ Blues. Mark Thornton (Jerry Reed), who has produced the last four albums, joined Larry Marrs (George Jones, Randy Travis, Marty Stuart) in mixing the album tracks at Side Kick Studios in Nashville TN. Larry also contributed harmony vocals, whilst the album has been mastered in Sydney by Ted Howard (Lee Kernaghan, Kasey Chambers). w/ special guests Fanny Lumsden, Sweet Jean and DB’s. Tickets $15 available here. Corner Box Office 1300 724 867.